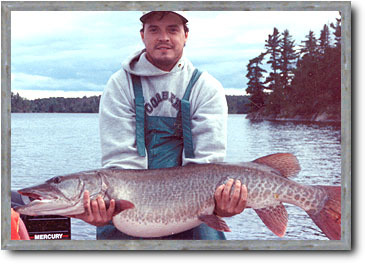 Lake of the Woods is World famous for monster-size Muskie, and is one of the best Muskie fishing destinations in the world. The legal size limit is 54 inches, which just goes to show you the incredible size these fish can reach. By the size limit, attitudes and knowledge of fishermen it is mostly a catch & release fishery insuring many years of awesome muskie fishing to come. Most of the musky fishing throughout the summer is spent casting with bucktails, jerk baits and top water plugs while the fall season trolling is often is more productive. There is nothing like the feeling you get from watching a monster muskie 6" between the eyes and as long as a paddle follow your lure to the boat. This kind of fishing is not for the faint of heart. You will remember your first musky long after your trip ends. If you really want to get serious about "musky fishing the woods" heavy line and medium heavy 7' rods will help you put fish in the boat and help cast some of those big baits used. Most of the fish caught seem to average around 25+ pounds but 40 pound plus fish are spotted and caught every year. You better have lots of line on your reel because these fish slam your lure like an asteroid and rip 50 yards of line off your reel before you know what's going on. There is a World Record waiting to be caught here. Limit - Full Sport License: 1 in 1 day with only 1 in your possession.